Ringya, an address book app, lets you collect and organize all your address lists into your smartphone by capturing paper and digital lists using your phone’s camera. 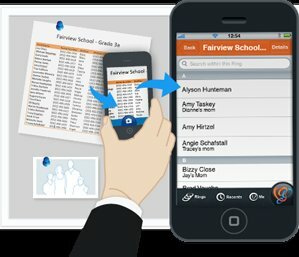 Wouldn’t it be great to get all those class lists, team rosters, club and committee lists, and office directories that are saved in your email attachments, or hanging on your fridge or bulletin board, into an address list on your phone, with zero effort? Ringya, a recently launched address book app, allows you to email a digital list to the app, or simply snap a photo of a paper list and Ringya transforms those lists into smart, organized groups or “Rings,” making them accessible to you when you need them most. Ringya also helps you put Ring members into their real-life context. When Sally calls, you don’t have to remember that her son is in your daughter’s class – the Ringya address book app will let you know, so you can decide whether you ought to take the call in the middle of a meeting. This not only saves time and awkward exchanges (especially with all those people you’re supposed to know, but you don’t really know), it also means you’ll never miss an important call because you didn’t recognize the number. Ringya adds value to your life. It will save you time and help you stay organized. With this address book app, you won’t have to go through your email archives or look through paper notes to find a contact, ever again.